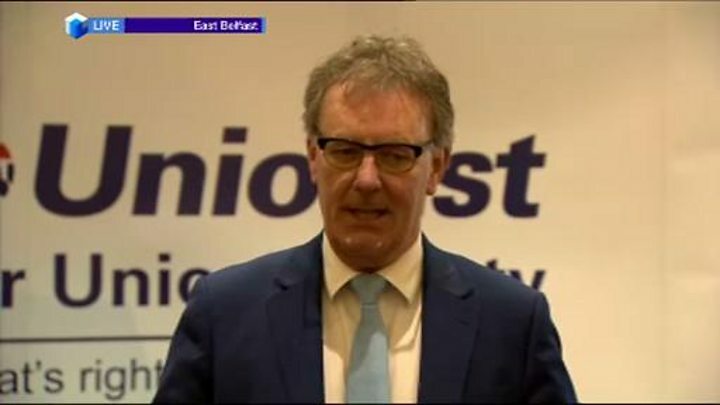 The Ulster Unionist leader Mike Nesbitt has announced he is resigning. The former broadcaster was elected to the Assembly in 2011 as an MLA for Strangford and became leader in March 2012 when Tom Elliott stood down after just 18 months in the job. Although he retained his seat in the 2017 Assembly election, several of his party colleagues failed to retain theirs. Mr Nesbitt said he would remain in the post until a successor has been found. The Ulster Unionist Party's (UUP) poor election performance saw a number of party figures losing their seats. Jo-Anne Dobson, Harold McKee, Jenny Palmer and former Stormont minister Danny Kennedy all failed to be returned. At a news conference on Friday evening, the UUP leader said it would be the "height of hypocrisy" if he did not take "full responsibility" for his party's results. However, he said he would remain as an MLA for Strangford. Mr Nesbitt said the electorate had rejected his message. "I am the one who suggested that in a normal society people would vote on performance and that the DUP and Sinn Féin did not earn another mandate," he said. "I'm also the one who said this should be Northern Ireland's first post-sectarian election based on the economy and education and health and housing and that I had a different vision but the electorate disagreed. "They certainly did not give me a mandate big enough for me to feel justified in continuing in this position so I shall not." Party colleague, Doug Beattie, who was re-elected as an MLA in Upper Bann said he was saddened to hear that Mr Nesbitt was standing down as he was a "personal friend and colleague". Former party colleague John McCallister described it as an "honourable decision". The Alliance Party leader Naomi Long said she was "quite shocked by how swiftly he had decided to depart the stage". In the May 2016 Assembly election, Mr Nesbitt said he was "stunned" when he topped the poll in Strangford. The UUP secured 16 seats at Stormont last year - the same number as the 2011 election. He said the UUP's campaign had been neither a success, nor a failure. Following the assembly elections in May 2016, Mr Nesbitt led the UUP into opposition at Stormont alongside the SDLP. In February, Mr Nesbitt faced criticism after saying he intended to give the SDLP his second preference in the Assembly election. Ulster Unionists had wanted the election to be a referendum on how the Renewable Heat Incentive debacle was handled but instead the focus turned to his comments. Senior party colleague, Danny Kennedy, who lost his seat as an MLA in Newry and Armagh, publically distanced himself from Mr Nesbitt in the aftermath of his remarks. UUP councillor Carol Black resigned from the party as a result of his comments saying the party's "whole ethos" had been destroyed by Mr Nesbitt's voting intentions. Mr Nesbitt defended his remarks and said he had received "very little criticism" while spending a lot of time time knocking doors in heavily unionist areas.